Math. Science. English. Facebook. Snapchat. Instagram. Welcome to the modern classroom, where the way in which a teacher is expected to engage with students, deliver the learning experience and manage discipline has forever changed thanks to the increasing prevalence of social media. With this new dynamic comes the expectation that teachers are appropriately managing their own social media actions, both in the classroom and in their personal lives. These new expectations recently led the Ontario College of Teachers (OCT) – which governs and regulates the province’s teaching profession – to launch an employee-focused campaign called Social Media Tips for Teachers to proactively reinforce the proper use of social media both in and out of the classroom to its more than 200,000 accredited members. The OCT primarily used social media to successfully share the social media refresher. Go into any elementary or high school classroom in Ontario today and you’ll find that many students, particularly those in their teen years, are in possession of a personal mobile device such as a phone or tablet. 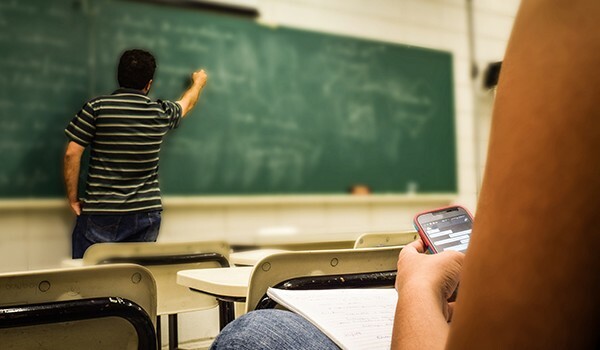 While some school boards around the world have banned, or are considering banning mobile devices, from the classroom, many others have embraced mobile technology and are asking teachers to leverage the devices to engage with their students in new ways to enhance the overall learning experience. For example, it is not uncommon for teachers to ask their students to use their devices – everything from iPads to Chromebooks to mobile phones – to Google a particular topic in real-time or check when an assignment is due on the classroom’s online app. Despite the many positives of technology in the classroom, the increasing prevalence of personal mobile devices comes with an added complexity … social media. For example, social media has forever changed the way in which a teacher manages discipline in the classroom. A visit to the principal’s office today can range from an inappropriate comment made online about another student or teacher to traditional schoolyard infractions to allegations of cheating on a test using the student’s mobile device. Along with managing their students’ social media usage, teachers must also ensure that they too are using social media appropriately. There have been a number of cases in which teachers sometimes run afoul of accepted social media etiquette. In Ontario, there are currently more than 200,000 certified teachers in the province’s publicly funded education system, working with a student base of close to 2 million from kindergarten through to Grade 12, according to the Ministry of Education. The Ontario College of Teachers (OCT) certifies approximately 11,000 new teachers each year through more than 50 education programs at 18 Ontario universities and colleges, and acts as the main regulatory body for the province’s accredited teachers. To address the increasing complexity of social media in and out of the classroom, the OCT issued a Professional Advisory on Sep. 17, 2017 to its teachers, outlining the dos and don’ts, and doing so primarily through its various social media handles, including LinkedIn, Facebook and Twitter. The OCT also shared an educational video on its YouTube channel. It was a refreshed set of guidelines originally issued in 2011. By using social media as the primary channel to engage with its teachers, the OCT took a unique and proactive approach to remind its “employees” of what is expected of them from a social media perspective. By using its public social media handles to share an employee-focused message, the OCT also ensured that the general public saw its efforts to provide guidance to its teachers and earn a reputational lift in the process. We decided to focus on this because social media was changing the way students and teachers were learning and interacting. We provided advice on how to maintain professional boundaries on social platforms, while still enriching student learning. Moreover, it was a reminder to our members that off-duty conduct (which often gets posted to social media) could impact their suitability to teach. All Ontario Certified Teachers must uphold the professional and ethical standards of the profession – care, trust, respect and integrity both in and outside of the classroom. With even more devices and greater adoption of social media in 2016, we felt it was time to reiterate what we said in the original advisory as well as provide an update. The updated version contains new information for teachers to minimize risks. For example, we are reminding our members that legal bodies and professional regulators like us are increasingly referring to mobile messages and social media content during investigations of professional misconduct. A seemingly harmless personal message read out of context could have unintended negative consequences for teachers and the profession. The reaction from teachers to the social media refresher has been positive, added Olivia. Josie, who currently teaches Grade 4 in Vaughan, agrees that the OCT’s approach has been well-received by many of her colleagues, as well as parents and students. The Ontario College of Teachers (OCT) took a unique approach to its refresher on social media guidelines for its 200,000-plus teachers across the province. By making the employee-focused campaign public through its various social media handles, it also showcased to the general public (i.e. students and their parents) that it was taking a responsible and proactive approach to managing the expectations of its teachers and their social media usage. A thumbs up for the teachers college and a welcomed social media refresher by all stakeholders in Ontario’s education ecosystem.